This is Pointe's April/May 2019 Cover Story. You can subscribe to the magazine here, or click here to purchase this issue. The third movement of Balanchine's Symphony in C is designed to wow, but it's not often a dancer manages to bring unadulterated joy to its brutally difficult steps. Yet when The Royal Ballet's Marcelino Sambé ran onto the stage last fall, the bright, cheerful buoyancy of his first grand jeté drew a gasp from the British gentleman sitting behind me in the Royal Opera House's chic Grand Tier. The stage isn't the only place where Sambé's infectious energy stands out. Time and again, company employees crack a smile at the mention of his name; a stage door attendant perks up when calling him over and chats animatedly about his performances. 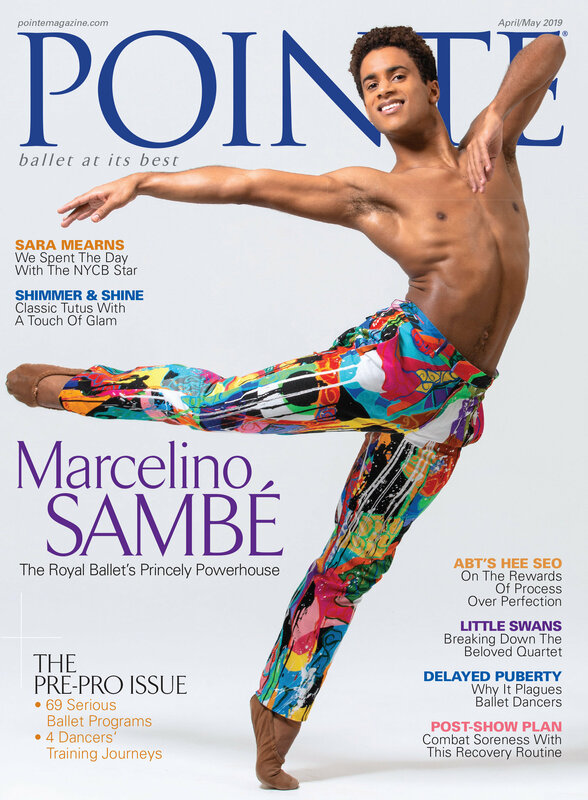 "He basically cheers up the whole Royal Ballet," says principal Francesca Hayward, a frequent partner of Sambé's. "He's one of those: Sunshine comes with him," Kevin O'Hare, the director of The Royal Ballet, concurs. "He's just a great, positive influence in the room and in the building." Wendy Whelan leads a crowded morning class. "The energy was amazing," she says. "Among the visiting companies, there was such a shared respect and friendliness toward each other." Kyle Froman. On a crisp day in late October, the studio air is thick and hot as dozens of sweaty dancers finish up grand allégro at New York City Center. Despite the fact that many of them are jet-lagged, there is a palpable, positive energy throughout the studio. Teaching class is former New York City Ballet star Wendy Whelan, which seems fitting. The dancers, culled from eight major companies around the world, are getting ready for opening night of Balanchine: The City Center Years, a five-day festival highlighting the choreographer George Balanchine's early works. The Royal Ballet's Francesca Hayward and Marcelino Sambé in Tarantella. Photo by Bill Cooper, Courtesy New York City Center. In 1948, George Balanchine and Lincoln Kirstein founded New York City Ballet at New York City Center. This year, in honor of its 75th anniversary, City Center is bringing together eight companies—American Ballet Theatre, The Joffrey Ballet, Mariinsky Ballet, Miami City Ballet, NYCB, Paris Opéra Ballet, The Royal Ballet and San Francisco Ballet—to perform 13 Balanchine works over six programs, running October 31–November 4. "I liked the idea of showing different perspectives on how Balanchine is performed internationally," says City Center president and CEO Arlene Shuler. "Bringing together these eight companies is unprecedented."